Today I found out the origin of the word “bacon”. The word derives originally from the Old High German “bacho”, meaning “buttock”, which in turn derived from the Proto-Germanic “backoz”, meaning “back”. By the 14th century, it found its way into Old French as “bacun”, meaning “back meat”. And by the 16th century, it found its way into Middle English as “bacoun”, which referred to all cured pork, not just the back meat. The phrase “bring home the bacon” has been around since the early 20th century and was initially used primarily by the working class, with bacon being a staple meat for that class. The difference between bacon and salted pork or ham is primarily in the brine used. Brine for bacon often includes sodium nitrite, sodium nitrate, and saltpeter for curing the meat; sodium ascorbate for setting the color, as well as speeding up the curing process; and brown or maple sugar for flavor, among other ingredients. One of the principle differences is that brine for ham tends to have a much higher concentration of sugar. American Bacon, or “streaky bacon” as the British call it, is generally cut from the fatty sides of a pig’s belly. Canadian Bacon, known as “back bacon” to the British, who apparently like to have their own names for everything bacon related, is made up of the tender loins located on the back of pigs. In continental Europe, the part of the pig American Bacon is made from is typically sliced into cubes and used as a cooking ingredient due to its high fat and rich flavor. Bacon actually is good for the brains of unborn children. Bacon contains a nutrient called choline which has been shown to boost the intelligence of people, if they got a lot of it before they were born. You can also get choline from eggs, liver, milk, chicken, and various nuts. 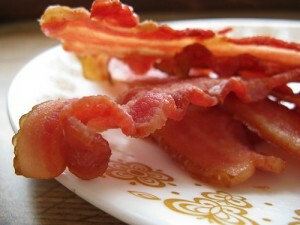 Records of bacon being made go all the way back to around 1500 B.C. in China. Bacon was also popular with the Greeks and Romans. A 200 pound pig will yield close to 20 pounds of bacon, among other popular meat products. The patron saint of bacon is Saint Anthony the abbot. He’s also the patron saint of swine herders, butchers, epilepsy, amputees, shingles, gravediggers, hermits, lost items, and Canas Brazil. We South Africans call it the same as the British. Probably because we were a British colony at some point:) Great site BTW. Bacon was invented in Britain so the British can call it whatever they wish. Provincial bluster. What you might know as bacon wasn’t “invented” in Britain, nor, did it originate with the British. And they can call it whatever they wish because nobody else actually cares. I must say, in Canada, we don’t say Canadian bacon either. Nor do we say American bacon. I’ve always heard it as just: bacon, back bacon, or ham. Choline is found in many foods. Some people justify eating anything because it has one or two healthful nutrients, while ignoring any negatives. Unless they are nescienct. Depends on what motivates [controls] them. Carcinogen …. but most tampered with foods [not directly obtained from nature/altered with fire] are most probably thus .. as future studies will correlate with most known diseases. Not denying it is tasty …. a major trap for most intemperate humans. For all we know humans taste similar, does that give cause to start farming? Greedy bellies worldwide dictated to by gullible carnal minds will not accept that effects that happen to them are caused, not just a result of getting older. I completely agree with Fred. To your point on Choline, it is also found in soybeans, cauliflower, peanuts, brown rice, quinoa, kidney beans and a whole lot of other plant foods…no need to slit the throat of a living animal to get your brain-fill of choline. Mmmmmmm……swine carcass, probably the truest statement in your review. We should call the dead animals that people eat exactly what they are and stop inventing and reinventing words to soothe guilty feelings. Nothing goes better with egg’s, Get over it.